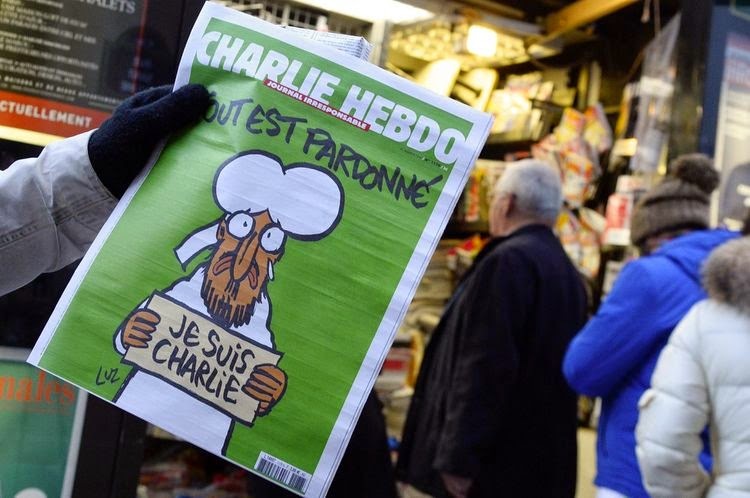 Muhammad in tears adorns the new cover of Charlie Hebdo: “I am Charlie. All is forgiven.” This is bigger than satire. IS arrested them. We killed them. Partners in terror. This is my thought, in any case, as I absorb a week of marches, solidarity and media commentary. A “thing” is in the air. Something horrible has happened: Seventeen people were murdered in Paris and several million residents rallied at the Place de la Republique, crying for peace and freedom. I feel the shock and emotional pull of these murders as much as anyone else, but I’m unable to understand why they seem to matter more than the bombing deaths of Syrians or Afghans or Iraqis, which are also acts of terror. They don’t, of course. And Muhammad weeps for them, too. So does the inexpressible largeness in everyone’s heart. Je suis Charlie. I am every victim of war and terror. Apparently it’s only terrorism if the killer has an Arabic name. The ongoing string of mass murders by non-Arab lone wolves (Sandy Hook, Aurora, etc., etc.) are isolated incidents that have nothing to do with GWOT. And the feel-good war we’ve been waging in the Middle East and Central Asia, shattering countries, displacing millions, killing unknown numbers of civilians, isn’t terror. Indeed, it’s suddenly justified all over again by the lunatics who stormed Charlie Hebdo last week. There’s a certain type of solidarity that requires an enemy, and I’m certain the national leaders who marched in Paris on Sunday were there to promote only this kind of solidarity, not the more troubled and complicated kind . . . the kind that sees no enemies, only victims. “It takes strength not to be saddened by the fact that the hierarchical structure of the human world results in millions of people expressing their horror at the effects of a divided world, whilst the so-called ‘leaders’ who promote and sustain such divisions march as if they are wholly innocent of the crimes they protest,” John Hopkins wrote recently at Common Dreams.